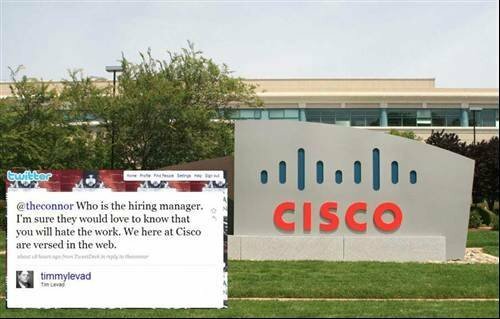 theconnor: Cisco just offered me a job! Now I have to weigh the utility of a fatty paycheck against the daily commute to San Jose and hating the work. timmylevad: @theconnor Who is the hiring manager. I'm sure they would love to know that you will hate the work. We here at Cisco are versed in the web. If you've got a (clean!) story of social networking gone wrong, share it with us to win some fantastic kit in our competition, sponsored by Blue Coat Systems. The closing date is Monday 18 May. Find out more and enter our web 2.0 woes and social networking blunders competition now!